So in the absence of an announcement of any release date for the RX Vision, I’ve sold the R3: part-exchanging it for a new Abarth 124 Spider which has now arrived at my dealer. 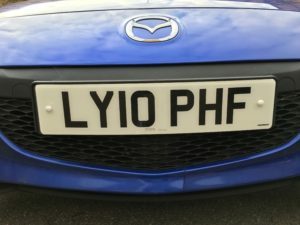 I’m keeping the personalised registration, so it’s getting transferred over and in the meantime, the RX-8 has been assigned a new registration number and the plates went on today. So yesterday evening, I went to our company car park to collect my car to discover one of the large bins up against the side of my car and a nice dent on the wheel arch. Yes, Southwark Council’s waste management operatives had managed to dent my car by wheeling one of their bins into the side of it. Great! So I’m logging a complaint with them now. 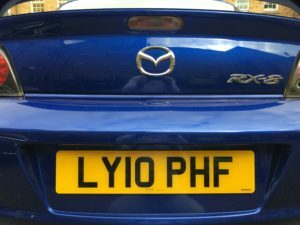 Yes, my RX-8 R3 is coming up to three years old (in a couple of weeks), so last week I took it to Docklands Mazda for them to carry out an MoT test … which it passed with flying colours, even producing 0% carbon monoxide emissions on fast idle and 0.04% carbon monoxide emissions at the natural idle speed. Mileage? 55,447 miles from new and still going like it should. Plus it still looks great. 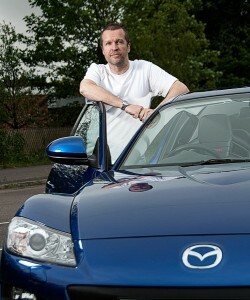 So yes, I’m pleased as I tend to hang on to my cars for a few years and there’s frankly nothing I’d want to replace it with at present, especially as Mazda stopped producing them. So the new Ford B-Max with the adverts featuring the high-diver diving through the wide opening doors as there’s no central pillar. It’s been described as “innovative”. The RX-8 was beginning to be a bit of a drift monster in the past few weeks in the wet up North despite no ‘advisories’ when I had it serviced. With the mileage I’ve been doing – its up to 44,000 miles in two years now – I had been getting concerned I hadn’t replaced the tyres in a long while so after a quick visual inspection I rang around and decided on Kwik-Fit this weekend (the tyres had to be ordered in at over £250 a corner). So I’ve now had a set of four Bridgestone Potenza RE050A 225/40R19 93Y tyres for the princely sum of £1020 including nitrogen filling. Here’s the third shot from the “Dodgy Deal” theme element of the photoshoot Janey and I did with Andrew Appleton: dark and mysterious! 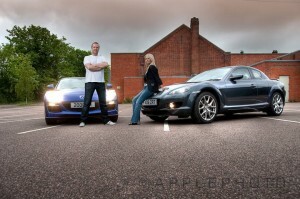 Yesterday, Janey and I went out to do a photoshoot featuring the two RX-8s with a great local photographer, Andrew Appleton.